South Carolina may be a lot of things—humid, leech-ridden, barely habitable—but it is not gay. And it is definitely not so gay. Its Department of Parks, Recreation and Tourism has made that clear by canceling an overseas advertising campaign targeting gay tourists. 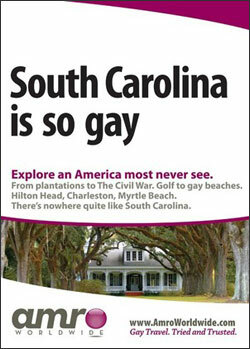 The offending slogan, “South Carolina is so gay,” is part of London-based Amro Worldwide’s attempt to turn a phrase often used disparagingly into a compliment, and has been adopted by a few other American destinations, namely Atlanta, Boston and New Orleans. But South Carolinians, especially spokesmen for the governor, feel that “using tax money to support a social or political agenda is inappropriate.” Good thing these guys don’t know what North Carolinians say about them.